Contrary to what the title of this post may suggest, I have not decided to partake in long pig ( aka human) in the form of a deceased person of the flower power persuasion. Whilst I am known for eating pretty much anything (clementines and tangerines excepted – vile fruit of the devil that they are), even I would draw the line at that. I have seen plenty of comatosed hippies at Glastonbury over the years (before it went middle class), but never (as far as I am aware) a dead one and I certainly haven’t ever been remotely tempted to take a bite out of one. No, what I am referring to is the “dead hippie” burger from Yianni Papoutsis, the genius behind Meat Wagon, Meat Liquor, Meat Mission etc. and (my venue of choice on the day in question) MEAT Market. I do wonder if Yianni was bullied at school by a hippie’s offspring. In addition to the dead hippie burger, the menu includes hippie fries (in hell – I added that bit) and I was half expecting a hippie juice(d) or hippie die(t) soda to feature on the menu (having said that there is reassuringly nothing even remotely diet related on the menu in these places). 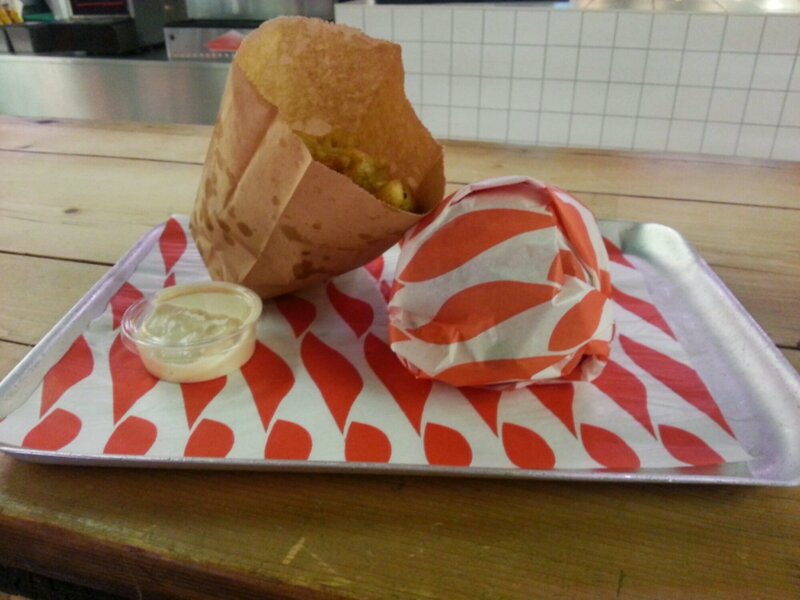 Now I am somewhat late in terms of reviewing this place (about 2 years), but I don’t get let out much and whilst I have visited MEAT Market and Meat Liquor a fair few times (not got to Meat Mission or the others yet) this was the first time since I started this blog. Anyhow, when I am in the big smoke I like to make the most of it and eat before getting the train back home (I am not one for shopping other than for wine or foodie stuff, as Mrs.SF will attest). 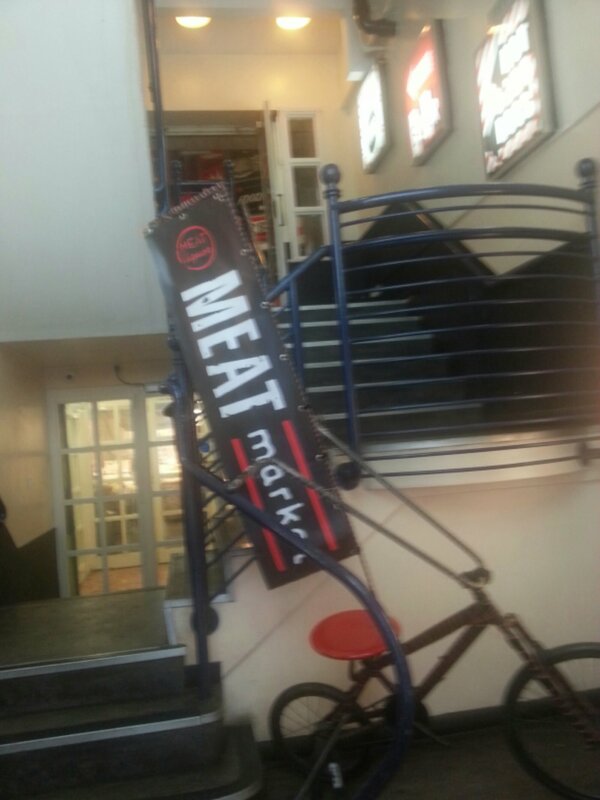 Of the Meat venues, I prefer MEAT Market to Meat Liquor. The former is a sort of McDonalds on acid\a burger bar you would expect to see in Bladerunner, but you can see your food as you eat it and the music, if a bit contemporary for me (about 99% of all music fits this description), is played at a reasonable volume. The later makes me feel old, the music is so loud (my preference would be a nice bit of Radio 3 or 4 please) I can barely hear myself think and I can’t see a damn thing in the place (which operates in a weird sort of Stygian gloom). I also think I single handedly double the average age of the diners and staff when I walk in. In short it is hip and trendy which is something I most certainly am not (evidenced by my use of the phrase “hip and trendy” – my Mother on seeing me say this sort of thing will probably be thinking” god we must of picked the wrong one up at the hospital”). MEAT Market on the other hand doesn’t try to be too hip or if it does it is lost on me. It is located on the Deck, a mezzanine level above the ghastly tourist tat filled Jubilee Hall Market off Covent Garden and can be accessed around the back of the market via Tavistock Street. It takes a bit of finding, but persevere. The entrance is understatement personified. The food menu has all the American classics with a mix of burgers, cheese steaks, dogs and various sides (looking at menu picture I have just noticed they do puds too – never realised that before). All are yummy. 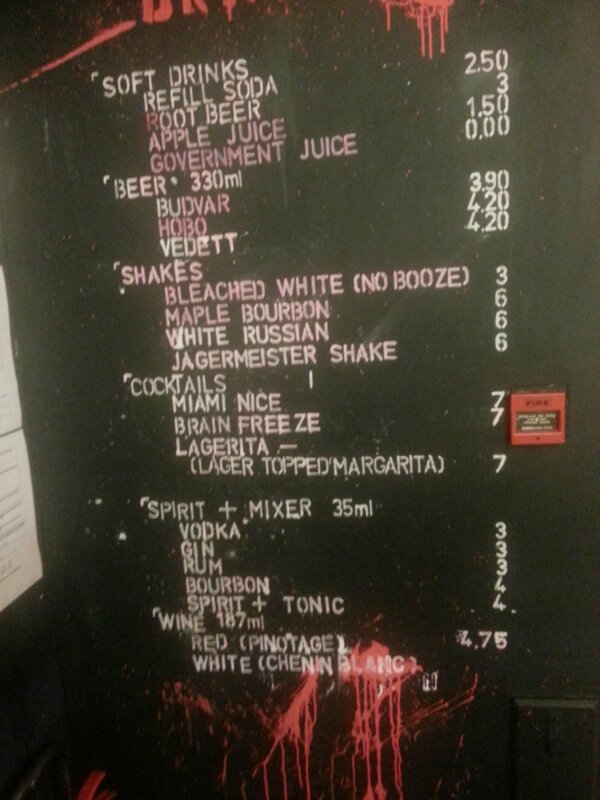 The drinks include the rather nice sounding maple bourbon shake and the awful sounding lagerita (a margarita topped with lager – really!?). I went for Government juice (water), it was free (I can just imagine Mrs SF thinking ” tight git” on reading this). That will be a no to the lagerita!!! My dead hippie burger can only be described as bloody lush, two patties of lovely beefiness cooked with mustard to just enough of a medium rare (to keep me happy and presumably keep the food safety police away from the door) with cheese, iceberg lettuce and pickle. The patties were a good texture, holding together well, but still being juicy and moist and were well seasoned. I could have quite happily eaten another, The cheese was nicely gloopy (a bit more of it would of been nice mind) and the lettuce was well lettuce (not much can really say about iceberg lettuce is there). Not sure about lettuce on a burger to be honest and I am definitely against a tomato slice. The dead hippie is a lovely tangy sauce (the recipe is secret, but I would guess Worcestershire sauce, mustard, chopped pickle and a thousand island based mayo and, pretty sure, no soylent green – oldies will know what that is, others look it up on Wikipedia– hippie in it) which went perfectly with the beef. You know how the best (actually the only remotely good) thing about a Big Mac is the sauce, well this is sort of like that only much, much better. The whole burger was wolfed down by me and eating it made me happy. The bun was soft and squigy so I could press it into the patties and get a bite of the whole shebang. I can’t be doing with a burger that you cannot eat without disassembling it (what is the point of the bun if have to do that). It did, however, eventually disintegrate under the weight of beef juice and the dead hippie before I could finish the burger patties, meaning I had to get down and dirty with the remaining bits of the patties and the hippie sauce. Not a problem I have to say. As for pickles in the burger, I love a bit of pickle in with my burger and cannot for the life of me understand why anyone would say hold the pickle. When certain friends methodically pick out the pickle slices from a burger my reaction is “I’ll have that”. To this end, rather than order the traditional side of fries, I went for more pickle but here they come with the outstanding bonus features of being deep fried in batter and accompanied by a blue cheese dip. These were a work of genius. 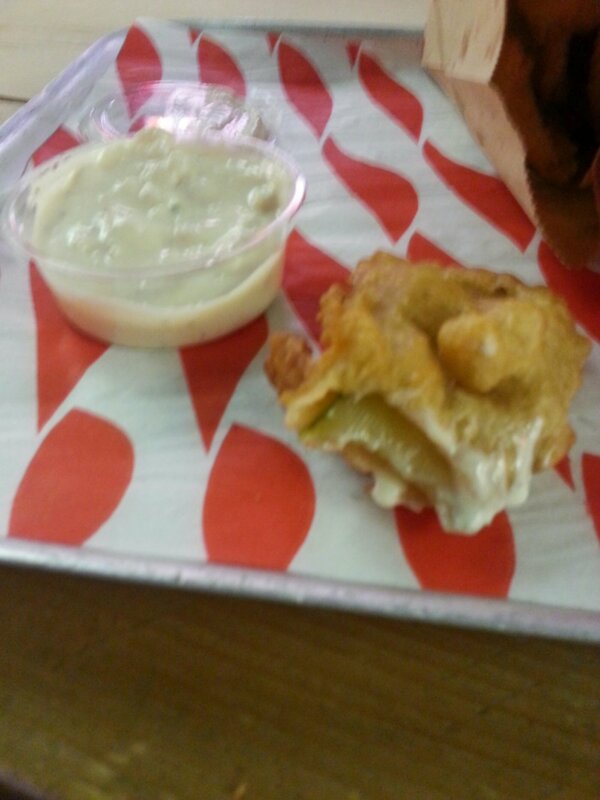 Vinegary pickle in a crisp batter shell complemented by a beautifully sharp and tangy blue cheese dip. I ate it all with gusto and made a right mess. 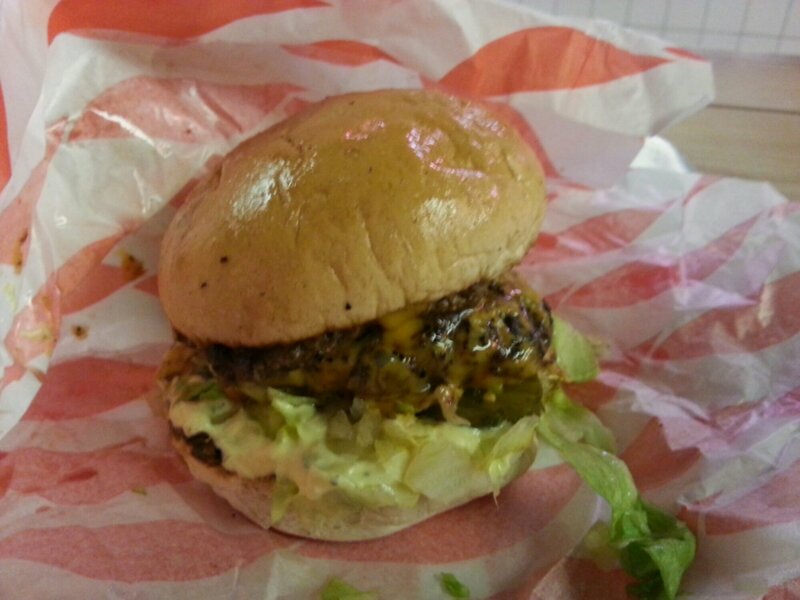 Price wise the dead hippie was £8.50 (solo burgers are between £6.50 and £8.50 ) which some may think is alot, but comparing it to other places it looks not bad value on a quality to cost ratio. Ed’s Easy Diner double cheese burger – which is pretty nondescript and vastly inferior in my view – is a similar price and Cardiff’s rather nice The Grazing Shed (my favourite burger place currently in Cardiff – need to get to the Urban Tap House, Cardiff to try burgers there) charges £7.95 for what I would say is a comparable solo burger (the very nice “John Wayne”). 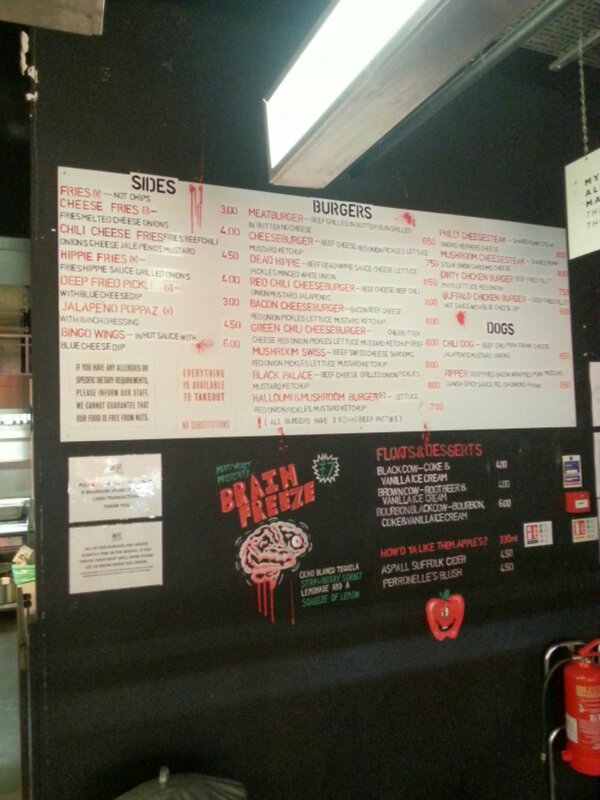 I love the dead hippie burger, in fact everything I have ever had at MEAT Market I have thoroughly enjoyed. The dead hippie is, however, now my benchmark burger as against which all others shall be tested (my juicy lucy burger is better, but I would say that wouldn’t I). MEAT Market ain’t pretty or fancy, but the food is great and the staff are friendly. 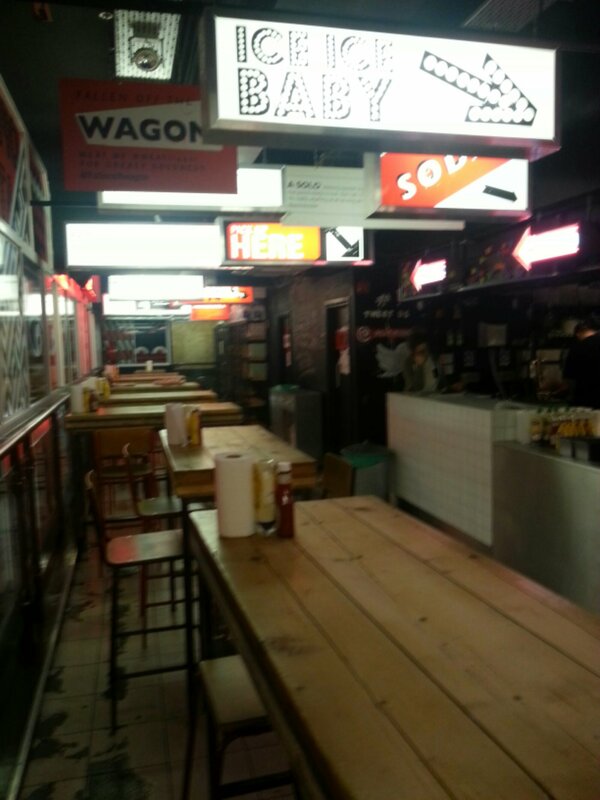 If you are around Covent Garden (can eat in or take away) this is the place to go for a mighty fine burger. Ooh I could eat one right now. Would I go back? Hell yes. 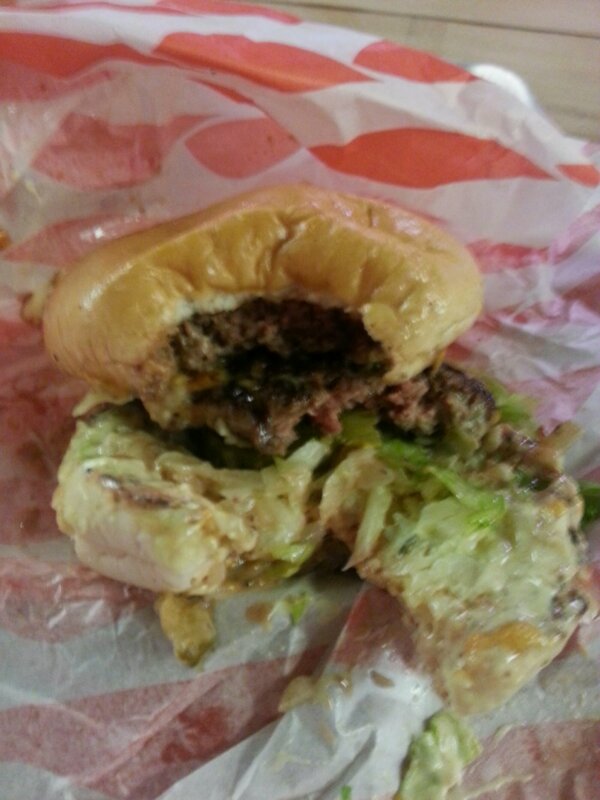 This entry was posted on Mar 23, 2014 by solicitingflavours in Burger, Food, london, Outside Wales, Restaurant Review, Wales.